This is a great rainy-day activity! 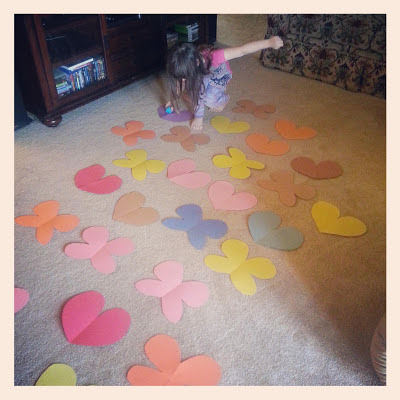 Cut out a bunch of butterflies and hearts and spread out on the floor. Put a tissue paper ball on one of them and have the kids tiptoe through the garden to retrieve the ball. Try not to touch the butterflies or hearts! Start out with them spaced out and move them closer together with each try. You can use other shapes as well, maybe just circles or just the paper, cut in half. This is a great breakfast bread. Goes great with your morning cup of coffee! This recipe won me 3rd place in the city bake-off for 2013. Dissolve yeast in water; let stand for 5 minutes to activate. Add sugar, milk, butter, eggs, salt, and 2 cups of flour. Beat on low speed for 3 minutes. Stir in enough of the remaining flour to form a soft dough. Knead the dough on a floured surface until smooth and elastic, about 7 minutes. Place in a greased bowl, turning once to grease top. Cover and let rise in a warm place until doubled in size. About 1 hour. While the dough rises, beat filling ingredients in a bowl until light and fluffy; set aside. Punch dough down. On a floured surface, roll into a 14X12 in rectangle. Place on a greased baking sheet (or parchment paper lined). Spread filling down center third of rectangle. On each long side, cut 1 inch wide strips. Starting at one end, fold alternating strips at an angle across filling. Seal end. Cover and let rise for 30 minutes. Bake at 375 degrees for 25-30 minutes or until golden brown. Let cool while you make the icing. Combine icing ingredients, drizzle over bread. This was a big hit at the Bake-Off! In a saucepan, melt butter over medium heat. Saute carrots and onion until tender. Stir in broth and lemon-pepper. Bring to a boil. Reduce heat; cover and simmer for 20 minutes or until liquid is absorbed and rice is tender. Fluff cooked rice with a fork. Serve hot. Another great ground beef recipe! In a bowl, combine the soup, mustard, Worcestershire sauce, horseradish; blend well. Set aside. In another bowl, combine the egg, bread crumbs, onion, salt, pepper, and 1/4 cup of the soup mixture. Add beef and mix well. Divide meat into six patties. Brown the patties on both sides in the oil. Drain any grease. Combine remaining soup mixture with the water. Pour over patties. Cover and cook over low heat for 10-15 minutes, or until meat is no longer pink. Serve over cooked noodles, hot rice, or mashed potatoes.